When people shop, their smartphone is now their go-to advisor and assistant. For retailers, this means big opportunities to be there and be useful in shoppers' micro-moments. This introduction to a five-part series reveals the mobile retail trends shaping the industry and why they matter. What's different today is that even though this behavior still happens, shoppers are omnichannel: Six in 10 internet users start shopping on one device but continue or finish on a different one,1 and 82% of smartphone users say they consult their phones on purchases they're about to make in a store.2 They get ideas, look up information, and make decisions, all from their smartphone anytime, anywhere. What's happening? Mobile is driving local. The bottom line: In this mobile-fueled shopping landscape, the retailers that thrive see the opportunity to be there and be useful for shoppers in what we call micro-moments—those intent-rich moments when people turn to their smartphones or other devices to know, go, do, or buy something. I-need-some-ideas moments happen when people have general awareness of the product category they're interested in, such as living room furniture, but they haven't yet narrowed down their choices to an exact product. Which-one's-best moments—a.k.a. consideration moments—happen when people turn to their phones in short bursts of activity to compare prices, brands and specs, and read product reviews from trusted sources. I-want-to-buy-it moments happen when the research is done and it's decision time. People make a choice about which brand or retailer to buy from, and whether to buy online or in-store. With these moments in mind, how can you ensure that you're there for shoppers? Be there: Identify the most important micro-moments and commit to being there, whenever and wherever a shopper is searching, especially on mobile. Be useful. In a consumer's moment of need, meet them by providing valuable information—whether it's product reviews, video tutorials, or the ability to purchase right away. The first step in being there and being useful is understanding and acting on shoppers' intent and their context. Intent is what the shopper wants in any given moment (Is she looking to browse or to buy? ), while context includes her location and the device she's using. If you marry intent and context with what you already know about your shopper (Has she visited your site in the past? Is she a loyal customer? ), you can start being there and being useful in the right moments. By targeting on demographics alone, you may miss out on valuable consumers who may be in market at that moment. Consider this example: If you sell car seats and you target moms alone, you'd be missing out on relatives or friends who might be in the market to buy a car seat as a baby shower gift. You may also be wasting marketing dollars by targeting moms who already own a car seat or women without children. It's less important for a shopper to be present in-store than for the store to be present wherever and whenever a shopper needs it. Let's look at one retailer that has put intent and context at the center of its shopper experience. Target saw that 98% of its guests were shopping digitally and that 75% were starting on mobile. But in categories like patio furniture, its in-store and online teams were still operating and marketing separately, even as more than 50% of their sales in the patio category were coming through Target.com. The company looked at it from its customers' point of view. Guests might search on smartphones for patio furniture, then see completely different merchandise when they came into their local store. So Target merged its online and offline marketing and merchandising teams into a single unified patio team that was mobile-first. It decided what products and signage to feature in-store based on digital demand. Target also ran Google local inventory ads to show customers on mobile the exact patio furniture that was available in the store nearest them. As a result, patio revenues in the stores in which Target made this change have been dramatically outpacing the stores in which the change has yet to be made. 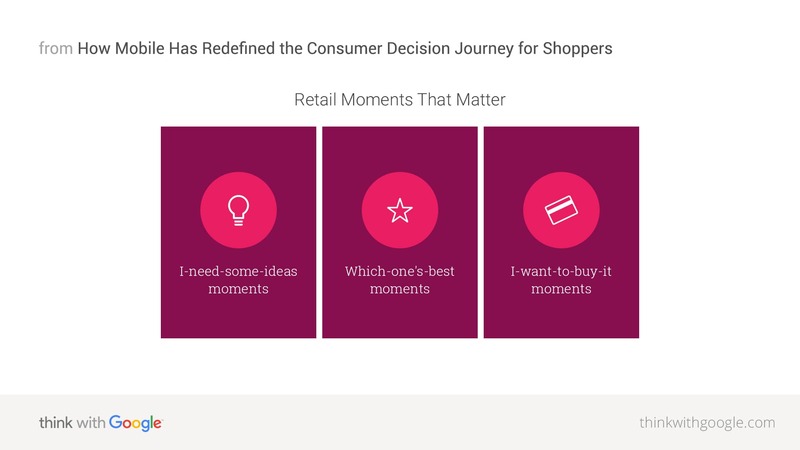 Consumer trends that define each of these retail micro-moments. Snapshots of real shoppers' purchase journeys. Actions retail marketers can take to be there and be useful in each micro-moment. Success stories from retailers using micro-moments strategies. 1 Google/Ipsos Connect, GPS omnibus, U.S. online respondents 18+, n=2,013, Mar. 2016. 2 Google/Ipsos, Consumers in the Micro-Moment, U.S., n=5,398 based on internet users, Mar. 2015. 3 ShopperTrak 2015 holiday, U.S. retail sales. 4 MasterCard SpendingPulse 2010–2015, U.S. retail sales. 5 Google Trends, Search for "near me," U.S., 2015 vs. 2014. 6 Google Data, aggregated, anonymized data from Google Analytics, U.S. only, Apr. 2016. 7 Google Analytics, retailer aggregated data, U.S., Mar. 2016.